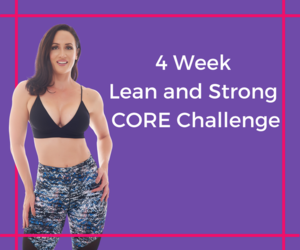 Join me for the 4 Week Strong and Lean CORE Challenge. Together we will power through at-home workouts that are tough on your glutes and core, and easy on your time budget. Plus get access to my Superwoman Grocery List to take your body to the next level. Work through 4 intense, challenging workouts each week that won't too much time in your day. Each workout is hand-delivered through the Fit Thrive App, with full video tutorials, workout tracking, and scheduling. Each workout has exercises that work your glutes and core, and can be done just about anywhere with just a few pieces of easy-to-store equipment. Take your leanness to another level with the grocery list that has all the food you need for the next four weeks. Rather than telling you what not to eat, I simply tell you what to buy. This is an intense list that will reset your body so you feel amazing at the end of 4 weeks. After that you can decide what to slowly add back in, and what to keep away. The app is a great way to keep accountability. I will provide extra support, and you will work alongside your fellow challengers. The great part about doing workout challenges is the community. We will support each other with cheers and pompoms the whole way. On top of that, the app will track your workouts so you feel accomplished at the end of each session. All you need is a set of mini booty bands and a loop band. Weight is optional. Stuck in a fitness rut? Need motivation to get going or get to the next level? This is the CHALLENGE for YOU! This 4 week challenge teaches you how to tune into your body, tap into your core, and reset your nutrition.